I got "Southwest" finished up the other day. I made one change. I decided to use Icing instead of the Tumbleweed. The Tumbleweed was just too gray for me. I like how the Icing stands out better making it looking cleaner and crisper. I then decided to work on my little "Acorn Scissor Case" yesterday. I got it finished up before the kids and I left to go to Chuck E. Cheese, which we couldn't go in to because it was filled beyond capacity. They were pretty disappointed (I was not). And since we couldn't go to Chuck E. Cheese I decided to go to A.C. Moore and get myself an early Christmas present! I got a Daylight Slimline Magnifying lamp. My Ott-Lite broke a while ago and I've been wanting a new light for some time now. And I've been wanting a magnifying light, so I can stop complaining that I can't see while working on 40 ct. :) I found a place online that carries the floorstand for this light at a good price with free shipping, so I may get that in the future. I would like to be able to take it around the house easily. Anyway, that's all for now! I started my November Flip-It Bit last night and I hope to get it finished up today. I'm so determined to get these done! Just one more after this!! :) Write soon! scissor case looks great and so does Sea to shining sea! That is exactly how it looks out here too, nice and sunny! sorry, i don't have any cactus in my yard though. I hear you about Chuck e cheese, blah.nightmare! That is a very lovely scissor case~~ Your Southwest is beautiful as well~~ I love this chart, and I am determined to get it after I finish moving!!! I'd rather go to ACM than Chuck E Cheese any day, lol! Your LHN project will be so gorgeous--it is already! You're making great progress on "From Sea to Shining Sea". I like your magnifying light - I have a magnifying light, and I don't know how I'd survive without it! Never mind the 40ct - I have trouble seeing 36ct. to stitch on! You have the fastest needles ever Nicole! 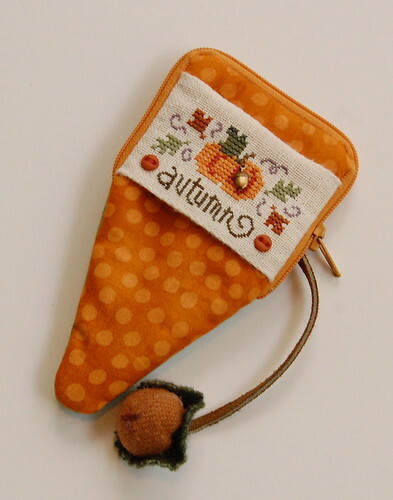 Everything is so cute and it's so wonderful seeing that needle case stitched up! Yippee!! Beautiful finishes Nicole especially like the scissor case. Great new magnifying lamp - is that the same one that Martha has? 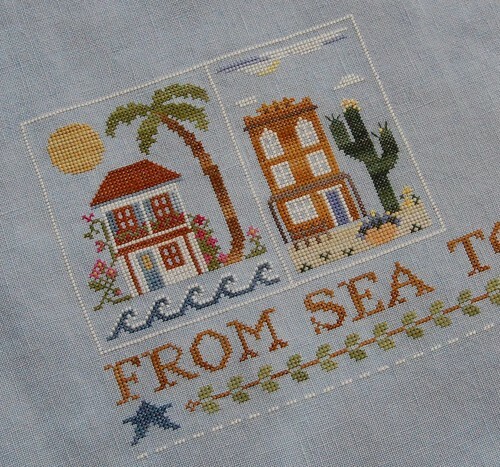 If I stitch Sea to Shining Sea, I want to do it on the blue fabric like you're doing! It's so gorgeous! Pretty scissor case! That was fast! Sea to Shining Sea looks awesome Nicole. A Package in the Mail! Stacy Nash Pinkeep Pillow Finished!